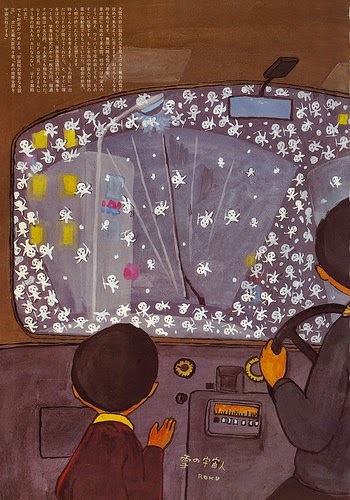 It is snowy here again today, so I thought I would feature this lovely and surreal illustration by Japanese artist Rokuro Taniuchi (1921-1981). Rokuro often positioned his figures staring with you into the picture as if you are looking over their shoulders. Another characteristic of his work is that inanimate objects such as light or in this case snow are anthropomorphised into tiny people. As often with rarer illustrators and graphic artists I have to thank 50 Watts for his amazing research and archive which is always a font of great amazement and wonder.